Or at least every one in the D.C.-area that's free next Wednesday! As many of you know, the D.C.-area bloggers/readers try to get together once a month for food, drinks and general good fun. For our January gathering, I've been working with Greg, the owner of Tasti D Lite in DuPont Circle for a fun project. He has very graciously offered to host me and as many of my blog friends/readers as we can fit into his store. 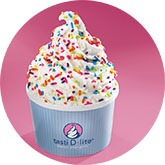 When: Wednesday, Jan 18th between 5 and 7 p.m.
What: Free frozen treats, good friends and fun! How to participate: All you need to do is write down one health-related goal you've made for 2012 and hand it to the server. Your goal can be anything from pledging to eat more fruits and veggies, to training for a 5K, to striving to walk more, etc. RSVP: We need a general count of how many people will be there. Please let me know if you plan to attend by Monday, Jan 15. You can leave me a comment or shoot me an email. If you're in the D.C.-area and free next Wednesday, I'd love for you to stop by for a little bit. Oh and if you're a blogger in D.C. join our Facebook group so we can keep you up-to-date on other fun meetups!